Will International Business Machines Corporation Raise Its Dividend in 2016? Big Blue appears to be struggling, but a dividend increase in 2016 is very close to a sure thing. International Business Machines (NYSE:IBM) has paid a dividend every single year since 1916, and the company has increased that dividend in each of past 20 years. IBM's latest dividend increase, announced in April, boosted the quarterly payout by 18%. 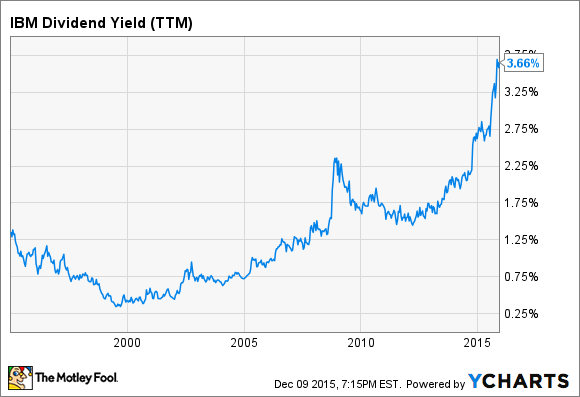 IBM's dividend yield is now the highest it's been in about two decades, thanks to both relentless dividend increases and a slumping stock price. IBM's revenue has been in decline over the past few years, driven by the company's ongoing transformation, divestitures of underperforming businesses, and changing foreign exchange rates. For 14 quarters in a row, IBM has reported a decline in revenue, and the company expects its earnings in 2015 to decline compared with last year. Given the company's current struggles, will IBM still raise the dividend in 2016? IBM's latest quarter looks like a disaster on the surface. Revenue slumped by 14% year over year, non-GAAP earnings per share fell by 9%, and the company cut its earnings guidance for the full year. However, the vast majority of the revenue decline was the result of IBM's sale of its x86 server business and currency fluctuations. Adjusting for these two items, revenue fell by just 1% year over year. That's still not a great result, but given that IBM is actively transforming its business, investing heavily in long-term growth opportunities, flattish revenue is probably the best that investors can expect until those efforts mature. Earnings fell alongside revenue, but CFO Martin Schroeter stated during the company's earnings conference call that the guidance for the full year represents earnings growth adjusted for currency. What this means is that IBM's declining earnings aren't the result of losing competitiveness. The headline numbers make it look as if IBM is falling apart, but that's simply not the case. IBM generates a tremendous amount of cash, and in 2015, the company expects its free cash flow to remain flat compared with 2014. IBM produced $12.4 billion of free cash flow in 2014, adjusting for receivables related to its financing business. This free cash flow is where dividends come from, and the good news for IBM investors is that only about 38% of the company's free cash flow currently goes toward dividends. IBM does spend a lot of money buying back its own shares, and over the past five years, dividends plus share buybacks have exceeded the total amount of free cash flow the company has generated. However, according to IBM's investor briefing earlier this year, the company expects to slow down the pace of buybacks in the long term, with a goal of reducing the share count by 2%-3% each year and returning 75%-85% of its free cash flow each year to shareholders. If IBM bought back 3% of its shares at the current market capitalization, the current dividend could increase by 40% before 85% of the free cash flow would be fully committed. In other words, IBM has plenty of room to grow the dividend, even if its free cash flow doesn't increase at all. Share buybacks have the added benefit of reducing the share count, meaning a 3% annual reduction in the number of shares allows the per-share dividend to increase without raising the total amount being paid out in dividends. Over 10 years, a 3% annual share reduction would reduce the share count by about 26%, allowing the per-share dividend to be boosted by about 35% before IBM would need to spend more cash on dividends. IBM is very likely to raise the dividend in 2016, and the company can easily afford to boost quarterly payments by 10% or more. If history is any indication, the announcement will come during the first half of the year, and it will mark the 21st consecutive year of dividend increases. With IBM sporting a decades-high dividend yield, now is the time for dividend investors to consider the stock.